During the October Nova Middle School assembly, the principal, Robert Crutchfield, honored the Reading All Stars -- those student who read more than one book during the Drop Everything and Read (DEAR) time in September. During DEAR, students read a book of their choosing for 25 minutes from Tuesday through Friday. On Monday, there is a traditional homeroom with an Advisory topic. During October, the students will participate in an anti-bullying campaign by reading fiction and nonfiction about bullying; then, join in discussion groups during the Advisory period. 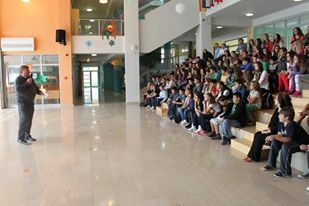 The assembly ended with the students enthusiastically shouting in chorus the Nova Middle School motto which is: "Aim High and Achieve Success!"